Lets talk about remote replication challenges, traditionally, you would need different tools in order to protect different applications and /or arrays, how do you replicate to more than one site? 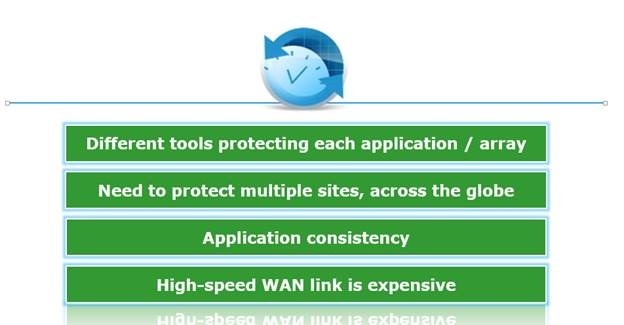 How can you achieve applications consistency and lastly, how can you utilize your WAN link in the best possible way? 4. Our first replication is done, great!, now let’s assume our RPO is 60 seconds, so RP will ask the array for the diff SCSI (deltas between what it sent to what it has), this is where the beauty of utilizing the amazing XtremIO snapshot technology kicks in, for us, snapshots are jut like any other volume, we dedupe and compress them globally! 5.. so in our case, we send the Diff answer to the RPA’s which will then build the bitmap of changes and store them in their “journals”, this is why in this integration, the RP journal can be very small, it doesn’t store anything but metadata, this is a radical shift from the traditional splitter based RecoverPoint where it used the journal to actually store the Diffs of the data as well, remember, we let each “entity” do what they do best, we (XtremIO) create and store the snapshots, RecoverPoint send and store the journal, scale out for primary IO’s and scale out for replication! · Periodic – sets the minimum time between cycles, the minimum is 60 seconds, the maximum is 1 day. · Continuous – no wait time, provides the best RPO in the market (for all flash array), guaranteed 60 Seconds! lastly, management of the entire solution is so easy, below you can see the entire workflow, this is a long video I made that’s shows many of the “advanced” parameters, one of things I like about the RecoverPoint solution is that it has an “easy” and advanced’ buttons, an entire replication can be configured in 10 seconds and on the other hand, you can go in an push knobs to your liking as well, I really cant wait for customers to start using it!